THE DEBATE over whether humanity is becoming less violent has its beginnings in Ted Robert Gurr’s 1982 article “Historical trends in violent crime : a critical review of the evidence” (in Tonry and Morris, eds, Crime and Justice : an Annual Review of Research). Several other studies, mainly based on homicide data from Scandinavia and Holland, appeared to corroborate Gurr’s findings, and pretty soon this pattern of an apparent decline in violence was linked to Norbert Elias’s thesis of a “civilizing process”, first propounded in Über den Prozeß der Zivilisation (1939), but virtually unknown until it was republished in 1969 and translated into English. Specifically, he says that if the hunter-gatherer norms of 10,000+ years ago had been prevalent during the 20th century humanity would seen something like two billion deaths through warfare, rather than the 100 million that actually occurred (3:48-4:06). He modifies his position slightly in the book, saying that tribal warfare was nine times as deadly as war and genocide in the 20th century (“Rates of Violence in State and Non-State Societies”). 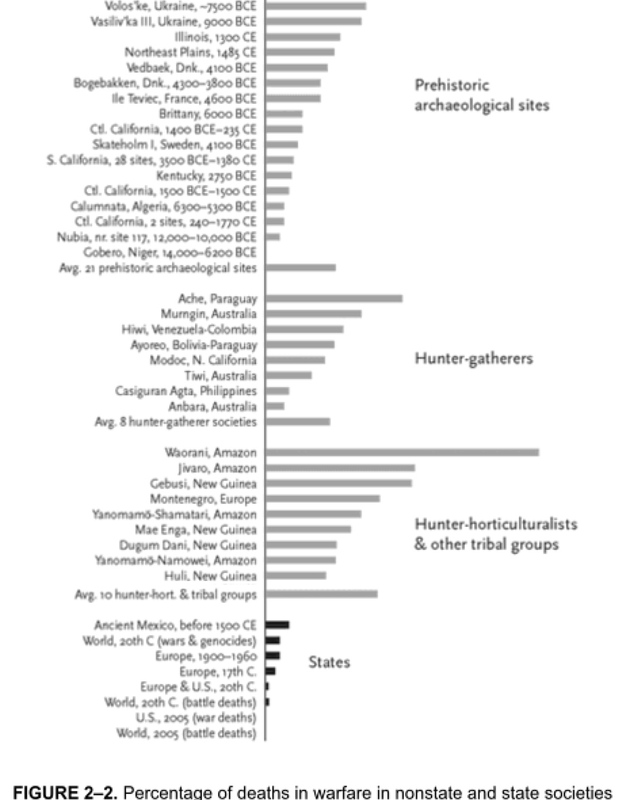 One can see where Pinker is going just from the above table; by his reckoning states, even in ancient times, were much safer, less violent places to live than non-state or tribal societies. The rather anecdotal evidence given in the video of violence in biblical times, classical antiquity and the medieval period is also more fully presented in the book than in the video presentation, though he does not fully erase the objection that, just because there were horrific war crimes and cruelty was tolerated in public spaces as a salutary measure and as entertainment, that does not in itself prove that there was quantifiably more violence. I won’t go into the second half of Pinker’s presentation, where he develops various theories about why violence is declining, because I’d like to slow down a little and think a bit more deeply about the basis for the assumption that violence is declining. How sure can we be that Gurr and Eisner and Pinker – and a string of other researchers in the area – have got it right? In spite of the virtual consensus that Eisner claims (cited above) the decline of violence may not be quite such a given as it appears to be. Richard Mc Mahon, Joachim Eibach and Randolph Roth, in “Making sense of violence? Reflections on the history of interpersonal violence in Europe” (Crime, Histoire & Sociétés, 17:2, 2013, pp. 5-26), sound a note of caution, pointing out that Pinker may be getting too far ahead of himself in attributing the decline to “individualism, cosmopolitanism, reason, and science” while others are still “preferring … to emphasize changes in medical expertise and practice, in the age structure of the population and also the difficulties inherent in the use of the available sources” (p. 6). 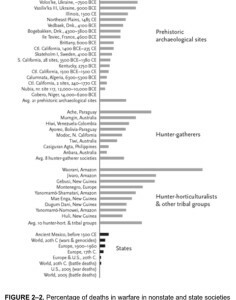 Historians of homicide are also not always comparing like with like when they compare homicide rates from the middle ages with those of later periods. In an English context … the homicide rates from the early modern period are often derived from the number of indictments for homicide while those for the middle ages are generated from coroners’ rolls … This would suggest that any simple narrative of decline is problematic. The available evidence rather indicates that rates fluctuated considerably between the late middle ages and the early modern period with … no obvious or consistent pattern of decline. There is also a difficulty for those who support the civilising process thesis in drawing on evidence from the fourteenth century without offering due attention to rates from the thirteenth century which indicate that rates at that time were actually lower than a century later. The use of the fourteenth century as a point of comparison can then serve to distort the difference between the middle ages and the early modern period. … the late sixteenth and early seventeenth century was a time of particularly high rates in many regions. This again distorts the difference between the eighteenth and earlier centuries … [and] suggests any broad narrative of decline driven by a wider civilising process is at least open to question. … Recent estimates suggest that circa 50 per cent of victims in the late nineteenth century would have survived if they had access to the benefits of modern medical care and emergency services … Might, for instance, individuals in societies that experienced major episodes of famine such as Ireland, Belgium and Finland be more likely to die following violent attacks than those in countries spared the ravages of widespread food shortages ? Remarkably there has, as yet, been no attempt to establish a correlation between homicide rates and broader trends in mortality and health over time and space. Stress and depression are serious health problems, if you suffer any of these this blog post is going to help you a lot. The impact of medical care and nutrition on homicide rates also has implications for the civilising process thesis. High homicide rates … are usually due to the prevalence of male-on-male fighting [which] must, however, be far less likely to lead to homicide in the present day due to medical intervention and improved nutrition that people do even using diets they find online as in this Rapid tone reviews… there is a lack of intent to kill in the first instance ; … the protagonists are less likely to have pre-planned the attack and are, therefore, less likely to bring weapons to the scene ; and … they are more likely than, for instance, cases of domestic violence to involve protagonists of similar strength. It is likely, therefore, that improvements in medical care would have a particular impact on the extent of homicides arising from male-on-male fighting relative to other forms of homicide. in homicide rates between different societies and/or periods without this necessarily reflecting a fundamental difference in the extent of non-lethal violence”. They are not saying that it is back to the drawing board on this, but they do seem to be suggesting that people like Max Christoph Roser, who are taking Pinker’s analysis as gospel and making it their starting point for further suppositions along the lines of Elias’s “civilizing process”, may perhaps be jumping the gun. Acknowledgement: A proof of Mc Mahon, Eibach and Roth's paper was sent to my by John Cronin (European University Institute, Florence alumnus), with the blessings of one of the co-authors (I think Richard McMahon). My thanks to both, and let me take this opportunity of giving a plug to their forthcoming book, which I understand is scheduled for publication in 2016.